Film remakes are a funny thing. Sometimes I’m really not a fan of them, but sometimes they can add a little extra ‘something’ to an existing film series that either makes the remake a truly fantastic film, or enhances my appreciation of the original film. 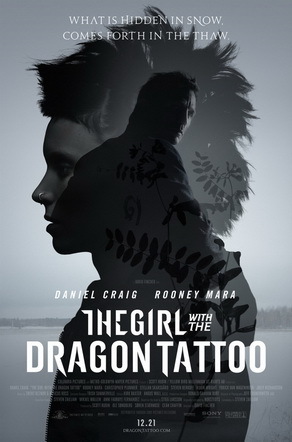 The Girl with the Dragon Tattoo is a remake that I’m sort of on the fence about. Whilst it was an enjoyable affair, ultimately I’m not sure it necessarily needed to be made. I’ve read the book series by Stieg Larsson back in the day (and loved them), and watched the original Swedish film trilogy (and loved them too). It has to be said that the original Swedish films are probably better than this one. Apart from watching this to see how David Fincher might interpret the source material, one wonders about the purpose of remaking the series. There’s a lot to enjoy about the film, but it doesn’t really add to the already existing Swedish film trilogy, which are already excellent films in their own right (and are 100% recommended by me). The acting in this is by and large very good. There are quite nice performances by Daniel Craig and Stellan Skarsgard. The real standout here, however, is Rooney Mara as Lisbeth Salander, who fully commits to the role, and who I will probably imagine in my mind as Lisbeth when I eventually re-read the books. The film is tense, quiet, and dark, with a good script, a gorgeous yet disturbing opening title sequence, and fantastic, buzzing, industrial music score by Trent Reznor. What’s really to celebrate about this film are its visuals. David Fincher has again joined forces with cinematographer Jeff Cronenweth, as they had previously worked very successfully together on Fight Club (1999), The Social Network (2010), and Gone Girl (2014). These two seem to be a very winning combination, as what has resulted is an absolutely beautiful-looking film which successfully captures the bleak nature of the book, successfully communicates Fincher’s love of symmetry and mirrored shots, and his apparent favourite colours of greenish-yellow, which persist across most frames of the film. That’s not to say I’m getting tired of it, because these colours are appropriate for the film and it looks amazing, but you do wonder about how far Fincher and Cronenweth can go with this colour palette given how often they use it. Perhaps The Girl with the Dragon Tattoo falls victim to ‘remake syndrome’; seemingly a film that didn’t really need to be made, and was forgotten about fairly quickly, the original Swedish films being generally regarded more highly. It is perhaps a shame that the next two books won’t be getting remakes as well, because not only would I like to see more of the visuals, but I’d definitely like to see more from Rooney Mara as Lisbeth Salander. The film is a good adaptation, and is generally enjoyable and worth a watch. Without further ado, please see below for a selection of my favourite visuals and shots from the film, mixed up to avoid spoilers. I’ve been meaning and meaning and meaning to watch this….great review. Now I really must watch it. PS: How are the wedding plans coming along? Wedding is all done and dusted, legally married now! 🙂 Everything went really well. Now time to relax and plan a honeymoon holiday! Congratulations! I’m not good at all the soppy things but…wishing you all the best together. What I liked about this interpretation is that it seemed more authentic with regard to the relationship between Lisbeth and Mikael. The Swedish film made the relationship seem sweet and as though it was built on equal reciprocity, but the Fincher film portrays it as much sadder and more desperate. And ultimately I think the latter is more true to the source material. You’re right – that’s one of the qualities that this remake carried over well from the books, that sense of desperation and longing. It is a shame that we didn’t get to see more of Craig and Mara’s interpretation of that relationship! I have all three books, I really want to get to them. Then I will watch this. Sounds decent enough, and I’ve always enjoyed Daniel Craig as an actor. Oh yeah, the books are great, you should definitely give them a read when you have time! Cool review Anna, seeing you review this brings back memories of when I saw this in the cinema way back when (I make it sound a lot further back in time than it actually is). From what I recall I thought the film was good, I really like Mara and Craig’s performance and some of the story material, but I wasn’t overly wowed by the film. Some have said it is better than the oriignal, but I have yet to check it out so I can’t make the comparison (its on my watchlist though). Thanks heaps Curtis! I really liked the Swedish films, they’re definitely worth a watch! You liked his acting here I didn’t see him for the role. Far too muscular and brooding. It is quite funny seeing Daniel Craig as a muscular, brooding journalist! He really succeeds at the creepy, more action-packed parts of the film though. I feel exactly as you do about this one. It’s a great story, great actors, excellent director so it’s a good film but it’s basically just there so that people who don’t like subtitles can avoid the original, which is similarly good. Yeah, it’s a funny one! Whilst I can appreciate it, it’s strange to think that it doesn’t necessarily need to exist? Great review Anna, but in all honesty I preferred the Swedish original. I love David Fincher but something here just didn’t click for me. Thanks heaps Vinnie! I really enjoyed the Swedish ones too, especially since they completed the trilogy! I wonder what Fincher would have done with the next two films though. I suppose we’ll never know. This is one of my absolute faves ever. I love Fincher so much, and Millennium is so so so good as a trilogy and translates so nicely into film. I feel like this remake was a shinier version of the Swedish film. I absolutely agree that it wasn’t necessary — but I appreciate it nevertheless, and mourn the 2nd and 3rd films that never happened. Elina! 😀 Hope all is going well for you! I wish they did the 2nd and 3rd films as well, especially with Fincher as director. Would have loved to see where Rooney Mara and Daniel Craig might have taken the characters!